Basing yourself in Brussels while exploring the rest of Belgium is a great idea. Centrally placed, Brussels is in a prime position for further exploration of the countryside. It's a particularly convenient base for scenic trips to locations in the middle and north of the country like Antwerp, Ghent, and Bruges, and also within just a few hours' drive of Amsterdam in the Netherlands and the tiny country of Luxembourg. Some of the most famous tourist attractions and things to do within easy reach are the historic battlefields of Waterloo and the towns and villages of the Flanders region, where you'll also find the attractions and battlefields of Ypres. For those who aren't keen on packing and unpacking constantly as they travel, staying in the capital and renting a car or enjoying the convenience of expert-guided tours for a series of day trips is a smart option. The little town of Waterloo in Brabant has become world famous through the historic battle of June 18, 1815 when the French army under Napoleon met the united armies of Britain, Hanover, the Netherlands, and Prussia. 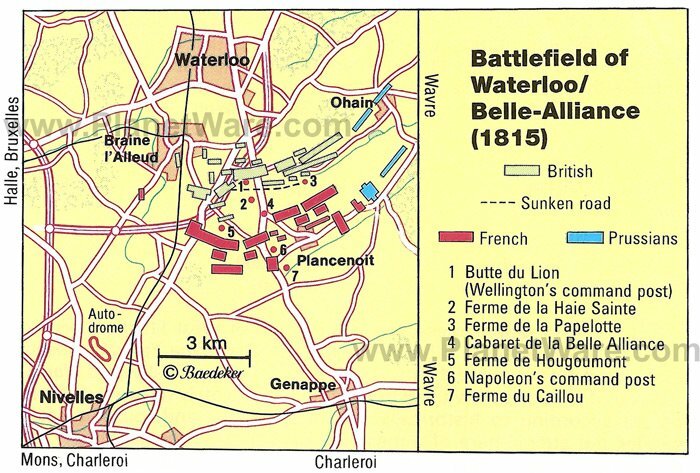 The battlefield is located to the south of Waterloo, mainly in the parish of Braine-l'Alleud, and now appears as a peaceful scene of pastures and fields of cereals. The Butte du Lion (also known as lion hill) rises above the former battlefield and is visible from afar. It was constructed between 1823 and 1826 on the place where the Prince of Orange received his fatal wounds. The hill was built up with 32,000 cubic meters of earth from the battlefield to a height of 40 meters. On the summit is a sculpture of a lion by Arthur-Louis van Geel, which weighs 28 tons and is more than four meters long. The lion stands with its right paw on a globe and looks to the south from where the French came. From the platform beneath the monument, up more than 226 steps, is a panoramic view of the battlefield. There is a convenient half-day tour to the Brussels Battle of Waterloo Sites that gives small groups (6 or fewer) the chance to visit Hougoumont farm, Lion Hill, the Memorial 1815 Museum, and other significant sites; a variety of departure times are available. The tiny country of Luxembourg sits at the southeast corner of Belgium, connected to Brussels by a major highway. It covers less than 1,650 square kilometers and houses only around 500,000 people, but it is an important political center in Europe due to its central location. Luxembourg City is home to many European political institutions, including the Secretariat of the European Parliament, European Investment Bank, statistical office Eurostat, and Publications Office of the European Union. The Council of the European Union also holds its sessions here several times a year, and there are around 11,000 international civil servants who reside here annually. The Old Quarter of the capital city has been designated a UNESCO World Heritage Site for its numerous historic castles; impeccably tended gardens; and fortresses, including the Walls of Corniche, which offer stunning views over the Old Quarter. You can visit two countries in one day with a fully-guided coach tour through the Ardennes region of Belgium to this fascinating city. The tour includes landmarks like the European Union buildings, the Notre-Dame Cathedral, and the 1572 Renaissance Grand-Ducal Palace. On the way back to Brussels, the bus stops halfway in the quaint town of Dinant, where you can visit its 13th-century Gothic cathedral and other sites while stretching your legs. Once the capital of a largely autonomous Flanders, Aalst straddles the banks of the river Dender and is a rather laid-back place, famous for its thriving flower industry. Photographers won't want to miss the colorful spectacle of Aalst's flower market (Bloemenveilinghal), which is held every morning in Albrechtlaan. In the Grote Markt (main town square) the original Town Hall (Schepenhuis) is a particular highlight for history fiends. Begun in 1225 and now the oldest building of its kind in Belgium, this ancient sandstone edifice traces the entire evolution of Gothic architecture over three centuries. A short distance east of the Grote Markt is the Sint-Martinuskerk. The choir and ring of chapels in this church are the work of famous architects Herman and Dominic de Waghemakere who built Antwerp Cathedral. The interior is graced with a collection of outstanding artwork, including the painting St. Roch and the Plague Sufferers attributed to Peter Paul Rubens, which hangs in the chapel to the left of the right-hand aisle. If you're visiting Aalst, don't miss dropping in to Moorsel, five kilometers east. Here, you'll find a moated castle (waterkasteel), which dates from the Renaissance period and is constructed entirely of red brick. It was built in 1520 as a summer residence by Charles de Croy, Abbot of Affligem and later Cardinal of Tournai. Afterwards check out Moorsel's main church, the 13th-century Sint-Martinuskerk, which according to tradition, grew out of a 7th-century communion chapel dedicated to St. Gudula. The present church contains three Baroque altars by Jacob Ulner. The countryside here is extremely pretty, full of rolling farmland, so a drive in this area is a great way to experience Belgium's gorgeous landscapes. The capital city of the Netherlands, Amsterdam is known for its nearly limitless tourist attractions, rich history, and cultural events. One of the city's most famous features is the network of 160 canals that shape the inner neighborhoods, including the aptly named Canal Ring. An art-lover's paradise, there are numerous museums, including the famous Rijksmuseum, with its seven million pieces of artwork; the Van Gogh Museum, which features his paintings, drawings, and letters; and the Rembrandt House Museum, which was the artist's residence for 20 years. Other must-see museums include the Anne Frank Museum, the Jewish Historical Museum, and the Museum of the Tropics focusing on the former colonies of the Netherlands. The full-day Amsterdam Day Trip from Brussels is a great option for those who want a customizable itinerary and an opportunity to explore the city independently, in addition to extensive sightseeing tours led by expert guides. Among numerous destinations, the walking tour includes a visit to the Royal Palace, Dam Square, and plenty of time for shopping at Kalverstraat's boutiques and the historic Vlooienmarkt flea market. Oudenaarde (in French "Audenarde") in the south of East Flanders, where the Flemish Ardennes gives way to the coastal moorland traversed by the Scheldt, is a quiet township, which possesses a considerable textile industry. For art lovers, Oudenaarde is, after Ghent, of great interest because of its impressive buildings in the Scheldt Gothic style and its magnificent Town Hall, built between 1526 and 1537 according to plans by the Brussels civic architect Hendrik van Pede on the site of the Courthouse (Schepenhuis), which had been pulled down. The architect followed the Late-Gothic city halls of Brussels and Leuven and introduced Renaissance elements. Once you've finished admiring the town hall, check out the lovely St. Walburga Church (Sint-Walburgakerk); the Bishop's Palace, built around 1600 and one of the finest Renaissance buildings in Belgium; and the Church of Our Lady of Pamele, distinctive for its tall narrow choir windows, the corner towers of the choir, and the octagonal crossing tower. For nature-lovers, the drop-dead gorgeous landscaped gardens and miles of walking trails of the Huizingen Domain are an unbeatable day out. There is plenty of history here as well. The first castle built on this site dates from the 15th century, but the real extension of the area began in the mid-19th century when the domain was created into the park seen today. Those with children in tow will find plenty to keep the little ones happy here with a zoo, swimming pools, and plenty of playground facilities. Otherwise, it's simply a wonderful place for a stroll and a picnic. 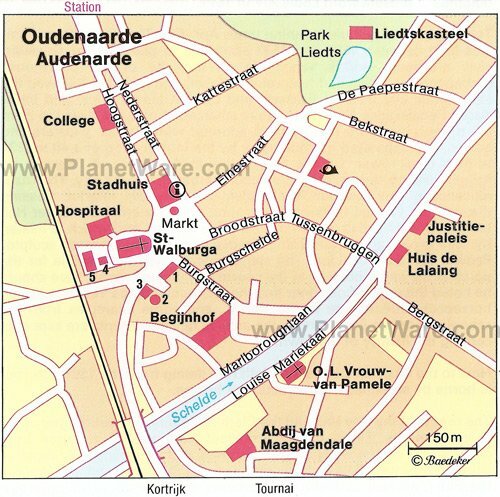 The little town of Ath (in Flemish Aat) was founded in the 12th century when Baldwin IV, Count of Hainaut, purchased the title to the area. Because of its strategic importance, he fortified it by building several castles. The 23-meter-high Burbant Tower (Tour de Burbant) is a relic of Baldwin IV's original stronghold, built in 1168. The walls are up to 3.7 meters thick leaving little room actually inside the tower. The rest of the castle was demolished in the 16th century. In the central city, the 12th-century Church of Saint-Julien is well worth a visit to see the sturdy tower with its four turrets and carillon of bells, while the Grand Place is home to the 17th-century town hall and a number of fine 18th-century houses. 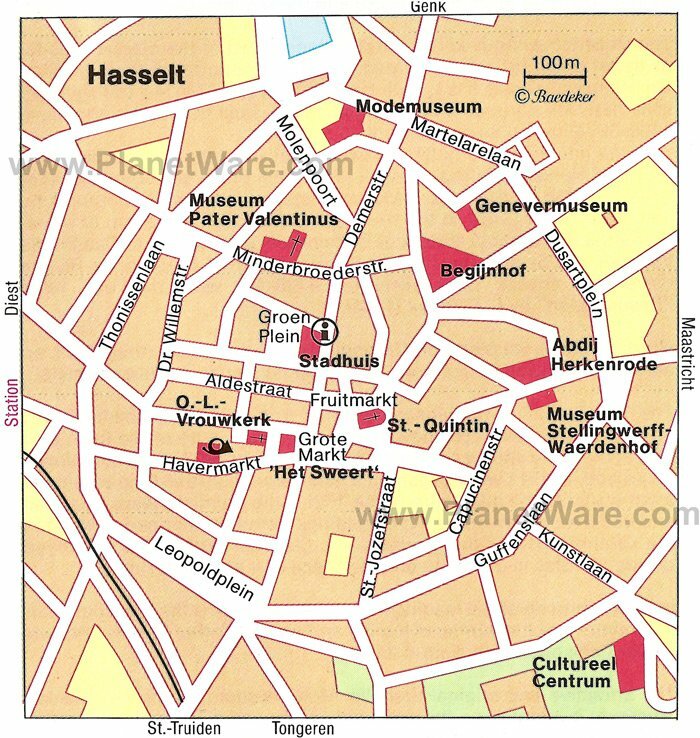 Hasselt is the lively capital of the province of Limburg. In the center, the busy Grote Markt is surrounded by several old patrician houses. Northeast from the grand place is the Gothic Saint Quentin Cathedral (Sint-Quintinuskathedraal) built in the 15th century on Roman foundations with an interior full of Gothic frescoes. A short walk from the Grote Markt is the Onze-Lieve-Vrouwekerk, which was built between 1728 and 1740 and rebuilt true to the original in 1950-1952 following its bombardment in 1944. On the east side of the inner town, you'll find the Museum Stellingwerff-Waerdenhof, devoted to local and town history. The most outstanding exhibit is the oldest known monstrance in the world dating from 1286. Laarne castle lies 11 kilometers east of Ghent, and it's great to combine both on one day trip. The 11th-century pentagonal fortress was built to defend Ghent and rebuilt in the 17th century. Today, it has two inner courtyards and a large keep on the right-hand facade and is surrounded by a moat. The interior is furnished in the French and Antwerp styles; with exceptionally beautiful Brussels tapestries dating from the 16th century depicting the Emperor Maximilian hunting. On the first floor is a collection of silverwork, which comprises chiefly French and Belgian silver from the 15th to 18th centuries, including a plate designed by Rubens in 1628, which belonged to the Tsarina Catherine II. The Ghent and Bruges Day Trip from Brussels first stops in Ghent, where you will enjoy a walking tour of the city's top tourist attractions, including visits to the Castle of the Counts of Flanders, as well as St. Bavo's Cathedral and St. Nicholas' Church. On the second leg of the day trip, you will visit the picturesque medieval town of Bruges and then spend some time in the UNESCO-listed town of Minnewater, with guided walking tours of each. The Dutch-speaking city of Antwerp was once the cultural capital of Belgium's Flanders region, known for its numerous guilds of craftsmen and artists. Its most popular tourist attraction is the Grote Markt (Grand Place), a prominent square that features the ornate Brabo Fountain, as well as the Town Hall (Stadhuis), the Ethnography Museum, and the Folk Museum. Antwerp's best Gothic churches include St. Paul's Church (Sint-Pauluskerk), which originated in 1517, and the Cathedral of our Lady, which dates back to 1352, while the Baroque interior and collection of art at St. James' Church (Sint-Jacobskerk) is equally impressive. Art lovers will appreciate the Royal Museum of Fine Arts, which houses a collection of more than 1,000 works by the Old Masters. The Antwerp Half-Day Trip from Brussels is a great way to visit this beautiful historic city, starting with a tour of the city's fortress, the National Redoubt of Belgium. In addition to the top tourist attractions, you will have a chance to admire the architecture of the grand 1905 Antwerpen-Centraal, the city's rail station, as well as have time to explore on your own.